Amlodipine is in a class of drugs called calcium channel blockers. Amlodipine widens the blood vessels, making it easier for the heart to pump and reducing its workload. 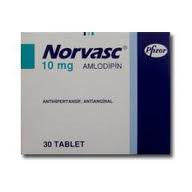 Amlodipine is used to treat hypertension (high blood pressure) and to treat angina (chest pain). Amlodipine may also be used for purposes other than those listed in this medication guide.